If you are married in the state of Arizona, it is helpful to know what the state statutes have to say about the legality of your union. If you are considering divorce, it is also important to know if you have legal grounds for divorce or not. In today’s post, we’ll review what constitutes a legal marriage in Arizona, the three different types of unions recognized by the state, and acceptable reasons for divorce in each. The Dorris Law Group is here for residents of the Tucson area who have questions about the divorce process. Read on to learn more, then contact an experienced divorce attorney for a free divorce consultation today. A marriage license. An official marriage license must be secured by the couple who intends to wed in the state of Arizona. Official solemnization. The union must be solemnized by someone who is authorized by law to do so, or by someone acting in this capacity and believed in good faith to be so authorized by one of the people being married. Solemnized on an active marriage license. The solemnization of the marriage must take place prior to the marriage license expiring. When these conditions are met, the couple has complied with Arizona Revised Statute (ARS) 25-111 and their marriage is valid. If you have concerns about whether or not these conditions were met when you first married and you are considering divorce, a qualified divorce attorney can help you. 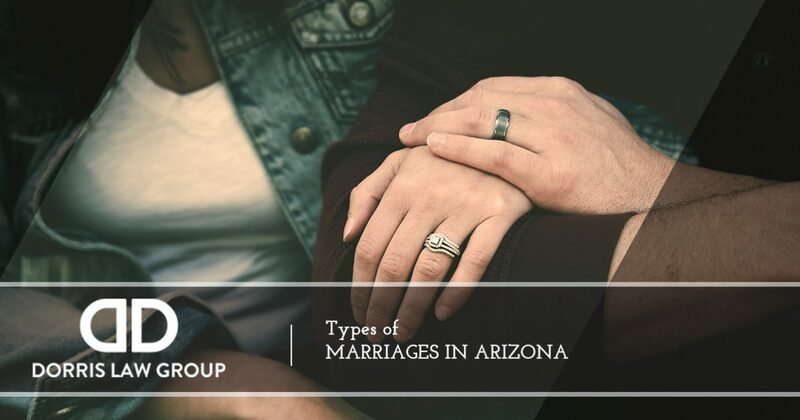 Now that we know the requirements for a legal marriage in our state, we will take a look at the three types of marriages recognized in Arizona. In this type of union, the couple agrees to premarital counseling to ensure that both individuals understand the nature, purpose, and responsibilities of marriage. 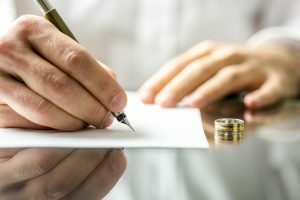 Couples often sign a contract affirming their lifelong devotion to their partner, and there are fewer acceptable grounds for seeking a divorce. Section 25-903 of the ARS defines the acceptable grounds for divorce, including adultery, imprisonment, and abuse. We use the word “traditional” to describe this type of marriage because it is the most common type of union in Arizona. Like covenant marriages, this type of marriage must meet the criteria of a legally recognized marriage that we reviewed earlier, however, there are no strict guidelines on what is deemed an acceptable reason for seeking a divorce. For these marriages, our state is a “no-fault” divorce state, meaning that neither spouse has to prove fault or responsibility to end the marriage. The state of Arizona does not recognize common law marriages, no matter how long a couple has lived together, whether or not they share property, or if they have children together. Common law marriages have not met the conditions set forth in ARS 25-111 because there was not a marriage license and no solemnizing of the union, and therefore, are not legally recognized marriages in Arizona. However, the state may recognize a common law union that originated in another state as long as the state of origination recognizes the union as legally binding. Do you have questions about the legality of your marriage, or are you curious about the acceptable grounds for divorce in your marriage? Divorce attorney John Dorris can help. Call our office at 520-622-4866 now to get started.